A Seattle Sunday Morning: 43 degrees F. Foggy and damp. It’s supposed to get up to 53 degrees F this afternoon, so who am I to complain about a little morning fog? I woke up grateful for many things, including the sense that my life has slowed down for this 30-day holiday period. I’ve purposely limited my social commitments so as to save my energy for the creative projects that are tugging at me. This afternoon, I might get the sewing machine out and see what I can fashion from my collection of pretty scraps and remnants. One lovely suprise happened last night, just as I was about to turn off the back episode of “Madame Secretary” I was watching and crawl under the flannel sheets. If you’re thinking about sending flowers to someone for the holidays, I’ve got a suggestion for you. This is Fran Sorin for DIGGING DEEP. A gardening colleague, Debra Prinzing, has singlehandedly created and committed her life to developing a nationwide online directory of florists, shops, and studios who design with American-grown flowers. It’s call Slow Flowers. 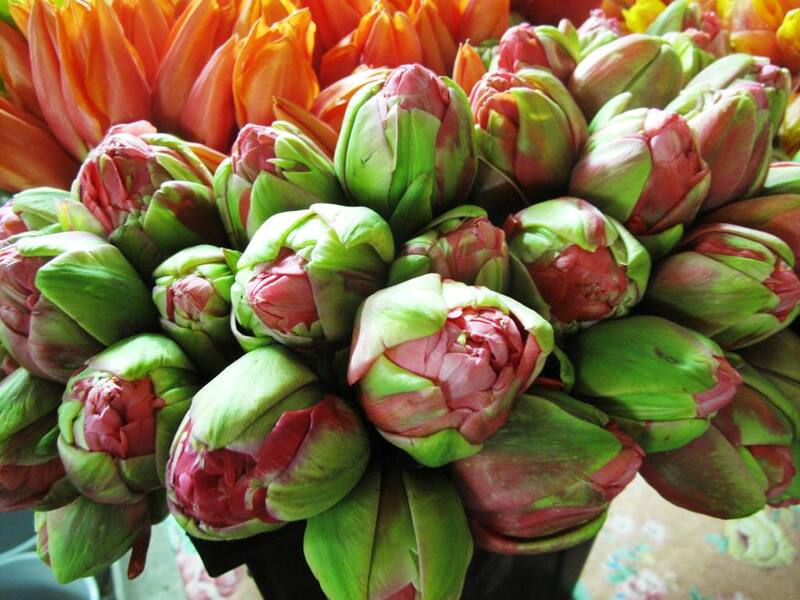 In the U.S., we spend close to $28 billion a year on floriculture. Around 80% of the cut flowers bought in the U.S. are imported. The Slow Flower Movement is following the sustainable values of the Slow Food Movement—which is to buy local, lower the carbon footprint, enrich the local economy, and preserve local farmland. 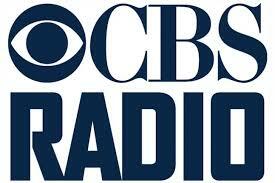 This is Fran Sorin for CBS Radio News. A lot like Fran’s unepected gift of a 1-minute endorsement heard on radios around the country, this next item also gets filed under the “out of the blue-gift from the universe” category. 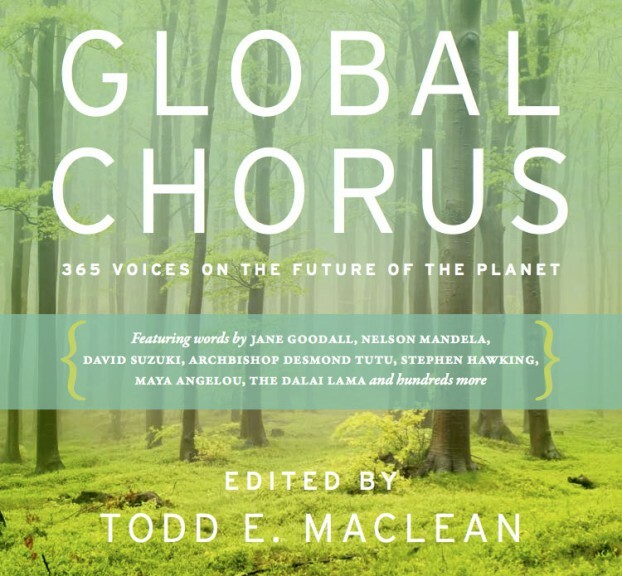 My name is Todd E. MacLean and I’m the Editor-in-Chief for an international fundraiser anthology that is currently being compiled called Global Chorus: A 365-Person Anthology of Worldwide Concern and Enduring Hope. With collected words from Jane Goodall, Nelson Mandela, David Suzuki, Stephen Hawking, Bill McKibben, R.K. Pachauri – Chair of the Intergovernmental Panel on Climate Change, Ashish Ramgobin – great granddaughter of Mahatma Gandhi, Frances Moore Lappé, Paul Hawken, Trudie Styler, Gloria Flora, Wes Jackson, Wendell Berry, Kenny Ausubel, Joel Salatin, Alexandra Cousteau, Archbishop Desmond Tutu, The Dalai Lama, and many, many more, Global Chorus is growing into a powerful anthology for a world in crisis; and through this letter, I am now extending to you an invitation to write a brief response for inclusion in the Global Chorus anthology. Global Chorus is a 365-day compendium, bringing together 365 contemporary voices and sharing in the experience and wisdom of many of humanity’s most concerned citizens. Contributors are asked to express their thoughts on the future of the planet, and the anthology will present a different contributor’s response for each day of the year. Proceeds from the sales of Global Chorus will go toward World Wildlife Fund, The Jane Goodall Institute, The David Suzuki Foundation and The International Committee of the Red Cross. I used Todd’s invitation to bring flower farming and flowers into the dialogue about global environmental issues and the individual choices we make to respect the planet. Todd helped me with a few edits and here is what ended up in the book, one of 365 essays (you can find mine on the page for October 19th). Learn more about Global Chorus and find a bookstore near you to purchase a copy. I’ll be giving these books as gifts this holiday season. macro to the micro and focus on individual action. touch (and even hear and taste) botanical beauty. This is a truth understood by all humans. often eat petals and buds, but they feed us nonetheless. in rural areas and keeping farm jobs viable. Gorgeous field-grown tulips, from Gonzalo Ojeda of Washington’s Ojeda Farms. This entry was posted on Sunday, December 7th, 2014 at 10:04 am	and is filed under American Grown, Blog Posts, Book reviews, Creativity, floral design, Gardening, General, Slowflowers.com the Directory of American Flowers, Spiritual Practices, Writing. You can follow any responses to this entry through the RSS 2.0 feed. You can leave a response, or trackback from your own site.